Today in class, we had time to work on capstone project. Make sure you are staying on track with all of that. Books should be read at some time this week. For those into "the sports" go baseball! I was wondering why the baseball was getting bigger, then it hit me. All critiques of your essay that happened (the one we did in class and any others you might have done on your own time) and the most current update of said essay. Book club updates including the sheet you should have filled out with your book club group on Friday (here). Any updates from your project (pictures, a short reflection, new developments, what your plans are for next week etc.). 3-5 Habits of a Great Learner. We watched two videos to analysis the cinematography, sound and story we will be using these videos to help better our final films. 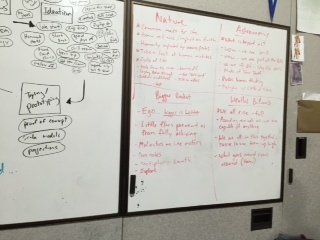 We then started a sheet that gave a basic outline for what we envision our films to be. We ended with capstone project time. The weather balloon and astronomy trips were both canceled. No, they eat the fingers separately. We had time to work on our capstone projects. For individual support please contact us at either one of our school emails, cegler2020@hightechhigh.org or lconover2019@hightechhigh.org and we will do our best to try to answer your questions for the project. Make sure you finish your essay for a critique tomorrow morning. Also put the book you want to use for the book club on this list. Because he was in need of a light snack. Today met in each capstone group to discus the thoughts and feelings we would like to be incorporated with our each individual project. Then we started on this sheet. We will be using said sheet for a brainstorm of ideas for the thesis of each group film. We also started looking at book club books that we will be reading and discussing. These books will be posted on tomorrows post due to technical difficulties. Make sure that you are all caught up on the blogs from the past as we will have very little class time to work on that. In class we tried to answer the question, "What is our project". After a short discussion, we watched this video. Then we talked about the video and what made it so powerful and hard hitting. Link to Mike's Blog here for this weeks blog post requirements. Today in class we did some more brainstorming with the whole class in the hopes of generating more ideas for the capstone projects. 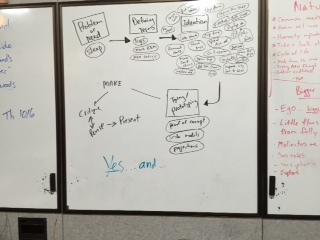 Here are the pictures of the whiteboard for the first part of our brainstorm today. ​I'm glad I know sign language, it's pretty handy.